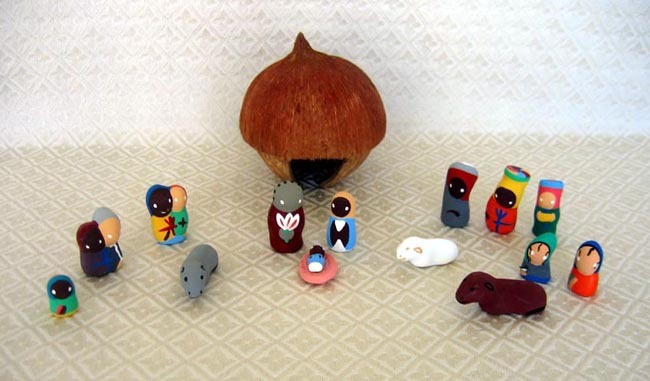 This Nativity has 14 handcrafted and hand-painted figures made of clay. The stable is a real coconut shell. School children make the set to finance their schooling in the seaside village of Jeremie, Haiti. The set includes Mary and Joseph, Baby Jesus lying on his manger, seven villagers (some are connected), three animals, and three wise men. The figures are approximately 1.75 inches tall. The coconut is 4.5 inches tall by 5 inches wide. The set comes in a cloth bag.